The Multicast service (rootinstall/applications/multicast) does not run on Adobe Media Server Standard. The multicast service is part of the Adobe Media Server multicast solution. The multicast solution is an end-to-end solution for live, corporate, multicast events. The multicast solution delivers a single, live stream to Flash Player clients over IP multicast, P2P multicast, and the combination of both (called fusion multicast). Collects information to describe and configure a multicast event. Generates a live stream name to copy and paste into Flash Media Live Encoder that embeds required multicast event settings as parameters within the stream name's query string. Generates a manifest.f4m file that you copy to the same folder as the multicast player. Captures, encodes, and publishes the live video to the multicast service on the Adobe Media Server. A server-side Adobe Media Server application that republishes the live stream as a multicast stream into a target RTMFP Group. A client-side Flash Player application that connects to the multicast service, joins the group, and plays the live stream. Open rootinstall/tools/multicast/configurator/configurator.html in a browser. The tool contains descriptions of each type. For Fusion and Peer to Peer, enter the server name (or IP address) and the full path to the multicast application, for example, rtmfp://ams.example.com/multicast. If the server is configured to use a port other than 1935, specify the port, for example, rtmfp://ams.example.com:1940/multicast. IP Multicast events do not require a connection URI. IP Multicast events use the URI rtmfp: which puts the NetConnection object in “connectionless” mode. Enter the name of the live stream, for example, CorpAllHandsQ2_2010, or livestream. The password ensures that only the multicast server can publish a multicast stream into the group. Other peers do not have the publish password and can only play the stream, not publish a stream. Enter a name for the group. To make the group name unique, select Make Unique. Use unique group names for streaming events occuring at the same time. For IP Multicast and Fusion, enter an IP multicast address and port to use for the live event. This is the address and port to which the live stream is broadcast. Get the IP multicast address from your IT department. The IT department sets up the multicast router and multicast address. The multicast address delivers data to all members of the group on the network. (Optional) If the server hosting Adobe Media Server has more than one network interface card (NIC), enter the IP address for one NIC in the Interface Address text box. Adobe Media Server uses this IP address to determine the appropriate interface to use when publishing. (Optional) To use source-specific multicast, enter an IP address and port in the Source-specific Multicast Address text box. For more information, see Source-specific IP multicast. A name for the live stream. To publish a stream, you’ll click Copy and paste this value into the Flash Media Live Encoder Stream field. An F4M file to use with the client multicast player. To view the F4M file, click View Manifest File. Save the manifest.f4m file to the same location as the multicastplayer.html and multicastplayer.swf files. By default, this location is rootinstall/tools/multicast/multicastplayer. To use Strobe Media Playback, leave the Configurator open. After you set up Strobe Media Playback, you will return to the Configurator and save the manifest.f4m file to the same folder as Strobe Media Playback. From the Preset menu, select a single stream preset. The multicast solution does not support multi-bitrate streaming. For AMS URL, enter the URL of the multicast service. If you’re testing on the same computer that Adobe Media Server is running on, enter rtmp://localhost/multicast. 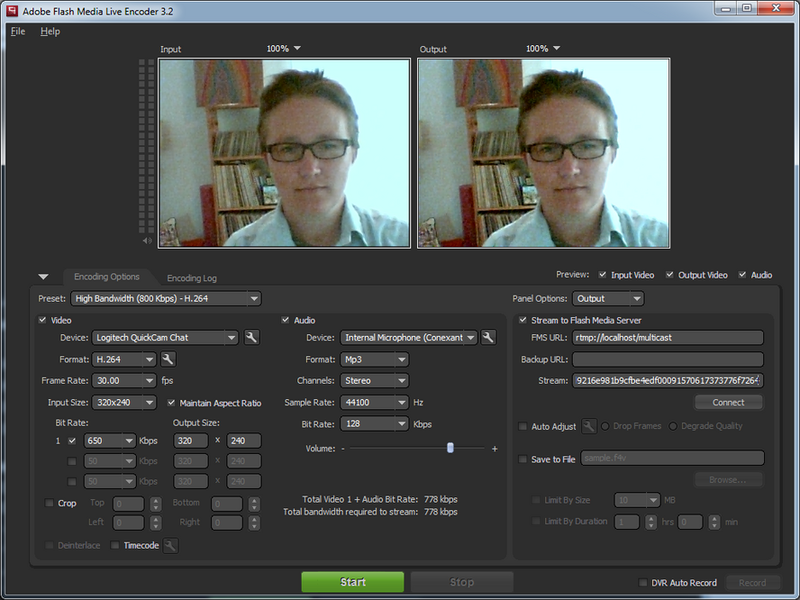 Flash Media Live Encoder connects to Adobe Media Server over the RTMP protocol, not over the RTMFP protocol. Paste the Publisher Stream Name you copied from the Multicast Config Tool to the Stream field. Click Start to connect to the multicast service and start streaming. Launch the Adobe Media Server Administration Console and click on View Applications > Clients. The RTMP client is the connection from FMLE to the server. The RTMFP client is a server-side peer established by the multicast service to republish the live stream into the target RTMFP Group. Open rootinstall/tools/multicast/multicastplayer/multicastplayer.html in a browser. On the Flash Player Help page, from the list in the top left, choose Global Security Settings panel. Click Edit locations > Add location > Browse for folder. Select folder containing the multicastplayer.swf file (rootinstall/tools/multicast/multicastplayer). In the Flash Player Settings Manager, choose Advanced and click Trusted Location Settings. Click Add, browse to the folder containing the multicastplayer.swf file (rootinstall/tools/multicast/multicastplayer). Click Confirm. Reload the multicastplayer.html file in the browser. The Adobe Flash Player Settings manager displays a Peer Assisted Networking dialog. Click Allow to allow the peer-to-peer connection. The multicastplayer plays the stream that Flash Media Live Encoder is publishing. Open the Adobe Media Administration Console to see the new client connection. Double-click rootinstall/samples/videoPlayer/videoplayer.html to open the sample video player in a browser. Copy the manifest.f4m file you generated using the Multicast Config Tool from the rootinstall/tools/multicast/configurator folder to the rootinstall/samples/videoPlayer folder. Both the multicast sample player and the Adobe Media Server sample player must use the same manifest file. In the sample video player, in the Stream URL text box, enter manifest.f4m. Click Play. Open the Adobe Media Administration Console to see the new client connection. There are now 4 connections: 1 from Flash Media Live Encoder (RTMP), 1 from the multicast application publishing into the group (RTMFP), 1 from the multicast sample player, (RMTFP), and 1 from the Adobe Media Server sample video player (RTMFP).